As referring to Jews, statistics deal mainly with populations, their ages and distribution, Migration, Morbidity, Mortality, Occupations, Criminality, Births, and Marriages. Most of these topics have already been treated in articles in The Jewish Encyclopedia; it remains to deal here only with the Jewish population as a whole and its distribution. The Pentateuch contains a number of statements as to the number of Jews that left Egypt, the descendants of the seventy sons and grandsons of Jacob who took up their residence in that country. Altogether, including Levites, there were 611,730 males over twenty years of age, and therefore capable of bearing arms; this would imply a population of about 3,154,000. The Census of David is said to have recorded 1,300,000 males over twenty years of age, which would imply a population of over 5,000,000. The number of exiles who returned from Babylon is given at 42,360. Tacitus declares that Jerusalem at its fall contained 600,000 persons; Josephus, that there were as many as 1,100,000, of whom 97,000 were sold as slaves. It is from the latter that most European Jews are descended. These appear to be all the figures accessible for ancient times, and their trustworthiness is a matter of dispute. 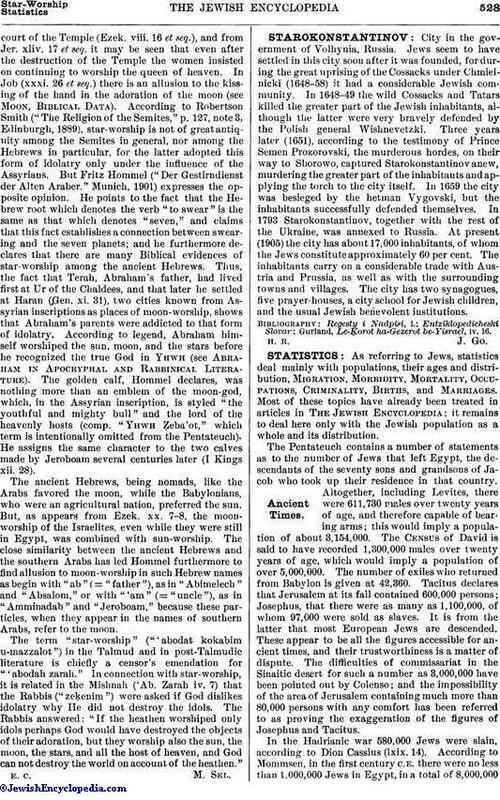 The difficulties of commissariat in the Sinaitic desert for such a number as 3,000,000 have been pointed out by Colenso; and the impossibility of the area of Jerusalem containing much more than 80,000 persons with any comfort has been referred to as proving the exaggeration of the figures of Josephus and Tacitus. In the Hadrianic war 580,000 Jews were slain, according to Dion Cassius (lxix. 14). According to Mommsen, in the first century C.E. there were no less than 1,000,000 Jews in Egypt, in a total of 8,000,000inhabitants; of these 200,000 lived in Alexandria, whose total population was 500,000. Harnack ("Ausbreitung des Christentums," Leipsic, 1902) reckons that there were 1,000,000 Jews in Syria at the time of Nero, and 700,000 in Palestine, and he allows for an additional 1,500,000 in other places, thus estimating that there were in the first century 4,200,000 Jews in the world. This estimate is probably excessive. Jewish Populations of Medieval Cities. Aix 1341 (203 families) "R. E. J." xiv. 170. Amalfi 1170 20 Benjamin of Tudela. Amsterdam 1620 (400 families) Grätz, "Gesch." ix. 503.
" 1671 (4,000 " ) Grätz, "Gesch." x. 257. Arles 1170 200 Benjamin of Tudela. Ascoli 1170 40 " "
Austerlitz 1523 445 Jew. Encyc. Avignon 1358 (210 families) De Maulde. Barcelona 1391 900 (?) "R. E. J." xiv. 170. Benevento 1170 200 Benjamin of Tudela. Blois 1171 40 Joseph Cohen, "'Emeḳ ha-Baka." Bourg St. Gilles. 1170 100 Benjamin of Tudela. Brindisi 1170 10 " "
Capua 1170 300 " "
Carpentras. 1277-1600 (12-119 families) "R. E. J." xii. 190.
" 1742 (168 families) " " "
Castellon de la Plana 1450 (31 families) Loeb, l.c. Castrogiovanni. 1400 (80 " ) Zunz, "Z. G."
Ceuta 1785 381 Cassel, p. 155b.
" 1840 150 " " "
Cologne 1348 (58 nouses) Weyden. Dyon 1384 52 Cassel, p. 111b. Estella 1366 (89 families) Kayserling, "Die Juden in Navarra," p. 45. Falces 1366 (18 families) Kayserling, l.c. Ferrara 1601 1,530 Cassel, p. 155b.
" 1785 1,066 " " "
" 1840 1,800 " " "
Frankfort-on-the-Main. 1241 200 (? families) Bücher. Genoa 1170 2 Benjamin of Tudela. Granada 1688 (1,500 houses) Usque. Hamburg 1612 (230 adults) Grätz, l.c. x. 18. Lucca 1170 40 Benjamin of Tudela. Lugo 1785 600 Cassel, p. 155b. Lunel 1170 (?) 300 (? families) Benjamin of Tudela. Manresa 1294 (45 families) Loeb, l.c. Marseilles 1170 300 " "
Melfi 1170 200 (? families) Benjamin of Tudela. Messina 1170 200 Zunz, "Z. G."; Benjamin of Tudela. Metz 1657 (96 " ) Cassel, p. 113a. Naples 1170 500 Benjamin of Tudela. Nuremberg. 1338 (212 adults) Ziemlich; Loeb, in "R. E. J." xiv. 170-M 173. Otranto 1170 500 Benjamin of Tudela. Palermo 1170 1,500 " "
" 1490 (850 families) Grätz, "Gesch." viii. Palma 1391 1,540 (?) "R. E. J." xiv. 171. Paris 1296-97 (82 families) " i. 63. Perpignan 1413-14 (180 " ) " xiv. 65. Peralta 1366 (10 " ) Kayserling, l.c. Pisa 1170 2 Benjamin of Tudela. Posquières 1170 40 (400 ?) " "
Rome 1170 200 " "
" 1550 3,000 Cassel, p. 155a. Salerno 1170 600 Benjamin of Tudela. San Marco 1492 350 Zunz, "Z. G."
Sanguesa 1366 (25 families) Kayserling, l.c. Strasburg 1349 2,000 Loeb, l.c.
" 1369 (6 families; killed) Cassel, p. 113a.
" 1383 (15 families; killed) " " "
Tafalla 1366 (10 families) Kayserling, l.c. Talavera de la Reyna. 1477 (168 " ) Loeb, l.c. Tarento 1170 200 Benjamin of Tudela. Trani 1170 200 " "
Trapani 1439 200 Zunz, "Z. G."
Trevoux 1429 (15 families) "R. E. J." x. 35. Tudela 1366 (270 " ) Rios, "Hist." ii. 285.
" 1386 (200 " ) Loeb, l.c. Venice 1152 1,300 Cassel, p. 158b.
" 1170 1,300 Benjamin of Tudela.
" 1500 933 Cassel, p. 159a.
" 1438 400 Grätz, l.c. vii. 371. The Middle Ages were mainly a period of expulsions. In 1290, 16,000 Jews were expelled from England; in 1396, 100,000 from France; and in 1492, about 200,000 from Spain. Smaller but more frequent expulsions occurred in Germany, so that at the commencement of the sixteenth century only four great Jewish communities remained: Frankfort-on-the-Main, 2,000; Worms, 1,400; Prague, 10,000; and Vienna, 3,000 (Grätz, "Gesch." x. 29). It has been estimated that during the five centuries from 1000 to 1500, 380,000 Jews were killed during the persecutions, reducing the total number in the world to about 1,000,000. 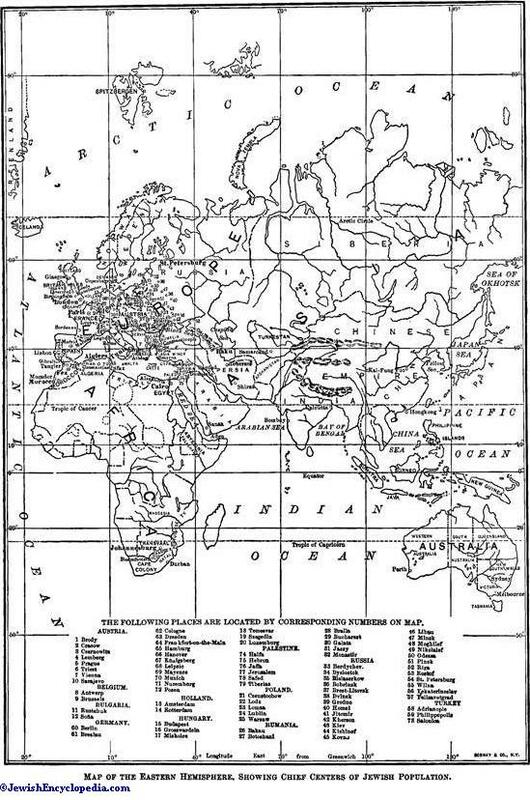 In the sixteenth and seventeenth centuries the main centers of Jewish population were in Poland and the Mediterranean countries, Spain excepted. According to the estimate of Basnage, at the beginning of the eighteenth century the total number of European Jews was 1,360,000, and the Jews of the kingdom of Poland (including Lithuania), according to a census at the first division in 1772, numbered 308,500. As these formed the larger part of the European Jews, it is doubtful whether the total number was more than 400,000 at the middle of the eighteenth century; and, counting those in the lands of Islam, the entire number in the world at that time could not have been much more than 1,000,000. Prague 1786 7,951 266 29.3 Ficker, "Bevolk. Böhmen," p. 55. Frankfort. 1811 2,214 159 13.9 "The Times" (London), Aug. 8, 1884. Prague 1843 5,646 279 20.3 Ficker, l.c. * From Reclus, "Nouvelle Géographie," v. 397. † Of these, 16,580 paid taxes. There is also a certain amount of evidence as to the Jewish increase in proportion to that of adherents of other creeds. The following table is taken from Haushofer, "Lehrbuch," p. 510, and from Oettingen, "Moralstatistik." But the figures of increase are often very deceptive, as they may indicate, not the natural increase by surplus of births over deaths, but accession by immigration. This applies especially to Germany during the early part of the nineteenth century, when Jews from Galicia and Poland seized every opportunity of moving westward. On the other hand, Ruppin has shown that within recent years, when forcible measures have been taken to prevent Russian Jews from settling in Germany, the growth of the Jewish population there has almost entirely ceased, owing to the falling off in the number of births, and, possibly, to emigration. The increase of the Jews of England and the United States during the last quarter of a century has, however, been exceptional, owing to extensive immigration. This would give an average of only 2,000 per annum throughout the century, but the number has largely increased of recent years. A rough estimate made ten years ago placed the number of conversions at about 3,000 per annum—1,000 in Austria-Hungary, 1,000 in Russia, 500 in Germany, and the remainder in the Anglo-Saxon world. A slight reduction, about 500 a year, must be made in the figures regarding the total losses, because of the converts to Judaism, such conversions resulting mainly through the marriage of Christian women to Jews. 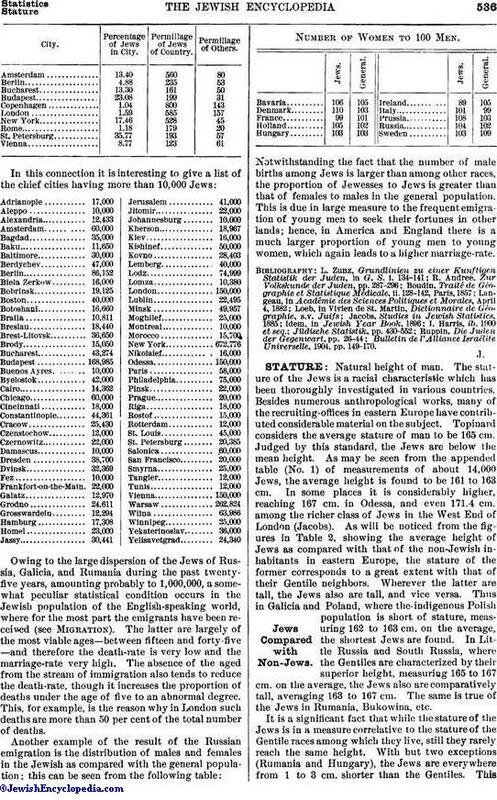 The difficulty of ascertaining to which cause any increase is due—whether to immigration or to natural augmentation—consequent upon the fact that accurate statistics with regard to Jews are available for comparatively few countries, formerly caused the widest diversity to exist as to the total number of Jews in the world, as can be seen from the list of estimates given in the table on page 531. The approximation of the latest estimates shows that the foundations for enumeration are becoming more sure and the variations possible less wide. 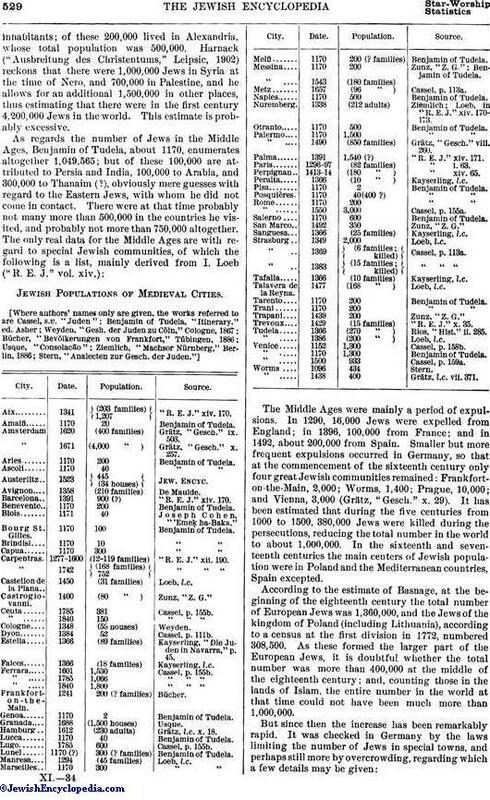 The basis of modern estimates is that of I. Loeb, given in 1879, the chief errors of which were theomission of the 1,000,000 Jewish inhabitants of Poland and the estimate of the Falashas at 200,000. Andree gives details founded upon actual censuses, and he has been followed by Jacobs, Harris, and Ruppin. Of the earlier estimates, that of Jost, in the tenth volume of his history, is the most noteworthy, and was founded on a set of careful figures and enumerations derived mainly from censuses taken about 1840. He does not estimate the total, but an addition of his figures results in 3,143,000, a figure probably not far from the truth. Of recent years very much fuller and more accurate details have been obtained as to the number of Jews, especially in Europe, where the majority of countries consider the religious creeds of their inhabitants as part of the census returns. 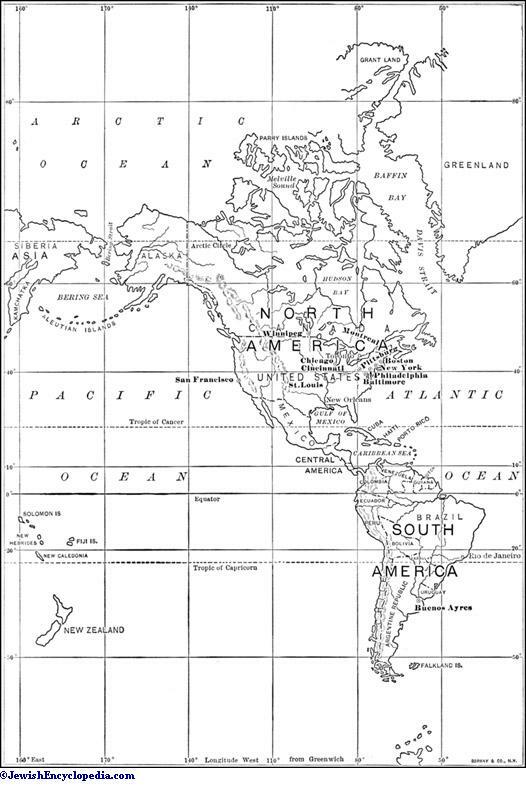 In the English-speaking world, especially in England and America, where no religious census is taken, recourse must be had to estimates instead of enumerations. These are mainly derived from three sources: (a) the death-rate, (b) the marriage-rate, (c) school statistics. As regards the first source, the burials in Jewish cemeteries are almost always a sure indication of the number of Jewish inhabitants. If the population is a stable one, an estimate based on the ordinary death-rate of the country would give too small a figure (see Mortality); where much migration has occurred the error would be still greater, owing to the fact that migrants are chiefly of the most viable ages. The estimate deduced from the marriage-rate is generally much above the true figures, if the ordinary marriage-rate is taken, as, owing to the nubile ages of migrants, a larger proportion of Jews marry in the Western countries. It is usual to assume that the children of school age, whose numbers can be very frequently ascertained, are one-fifth of the population. 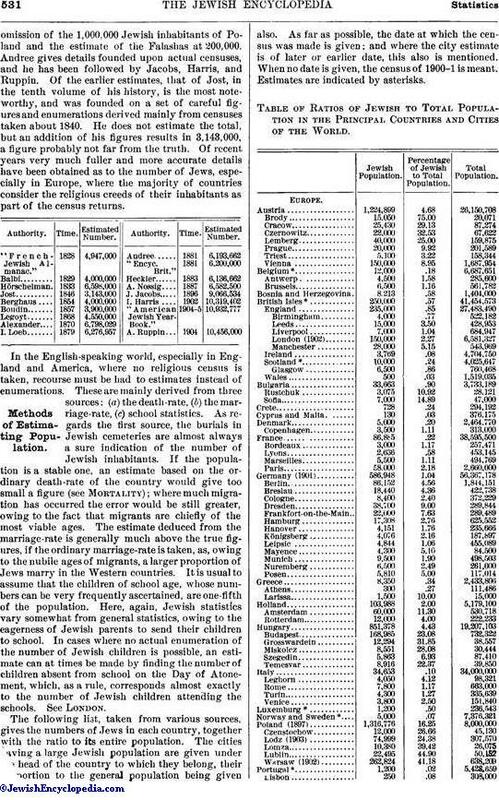 Here, again, Jewish statistics vary somewhat from general statistics, owing to the eagerness of Jewish parents to send their children to school. In cases where no actual enumeration of the number of Jewish children is possible, an estimate can at times be made by finding the number of children absent from school on the Day of Atonement, which, as a rule, corresponds almost exactly to the number of Jewish children attending the schools. See London. 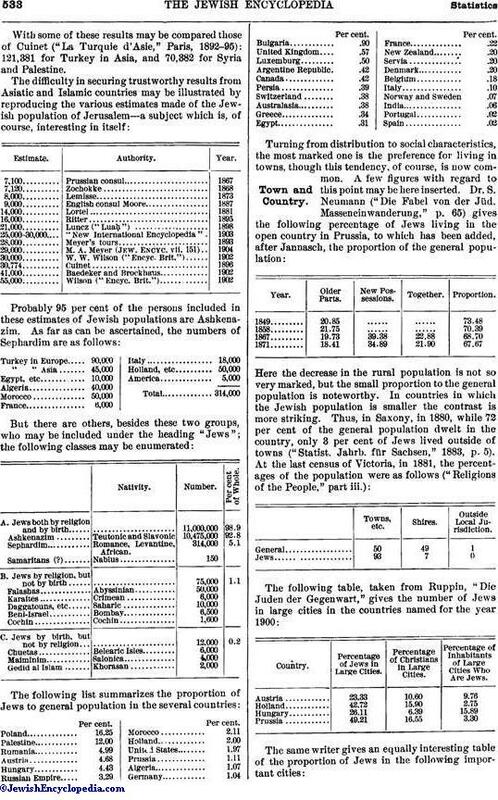 The following list, taken from various sources, gives the numbers of Jews in each country, together with the ratio to its entire population. The cities having a large Jewish population are given under the head of the country to which they belong, their proportion to the general population being given also. As far as possible, the date at which the census was made is given; and where the city estimate is of later or earlier date, this also is mentioned. When no date is given, the census of 1900-1 is meant. Estimates are indicated by asterisks. Table of Ratios of Jewish to Total Population in the Principal Countries and Cities of the World. Percentage of Jewish to Total Population. 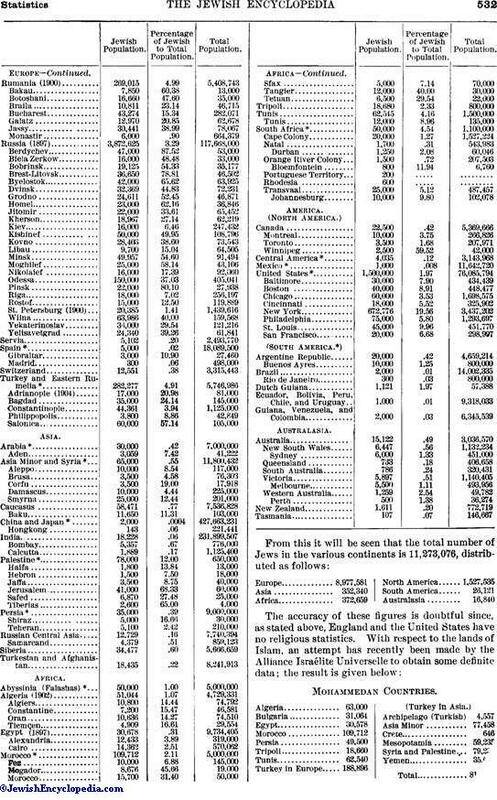 With some of these results may be compared those of Cuinet ("La Turquie d'Asie," Paris, 1892-95): 121,381 for Turkey in Asia, and 70,382 for Syria and Palestine. Percentage of Jews in Large Cities. Percentage of Christians in Large Cities. Percentage of Inhabitants of Large Cities Who Are Jews. 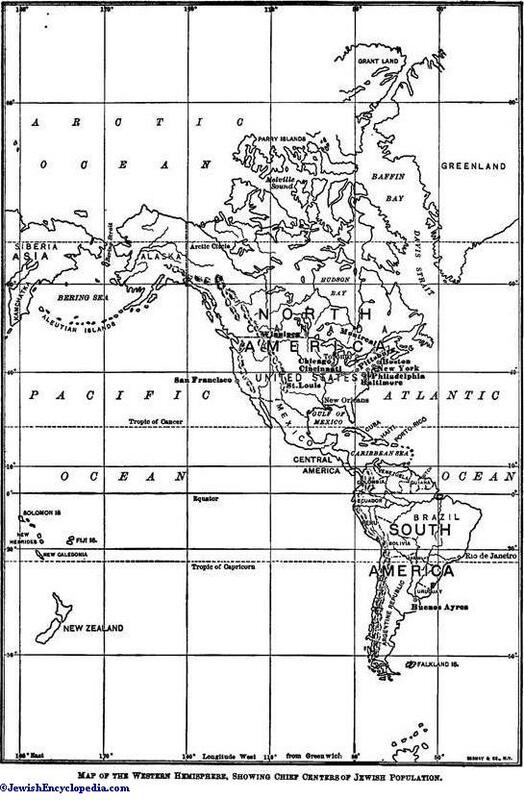 Map of the Western Hemisphere, Showing Chief Centers of Jewish Population. 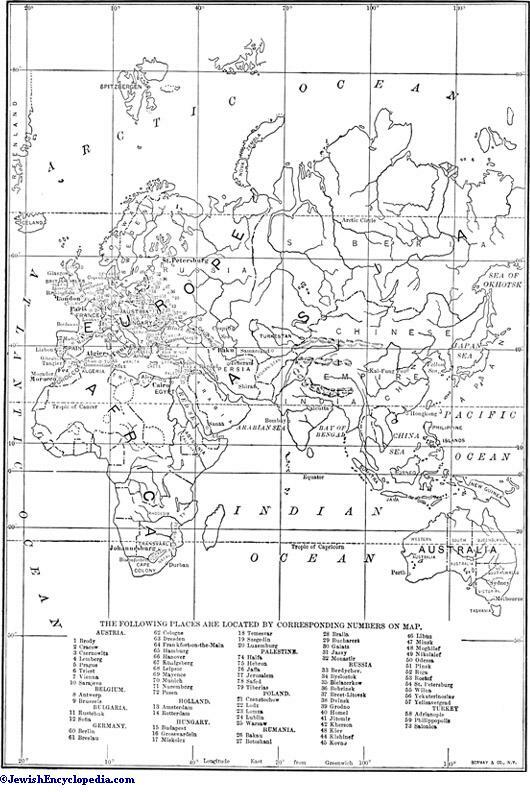 Map of the Eastern Hemisphere, Showing Chief Centers of Jewish Population. Percentage of Jews in City. Permillage of Jews of Country. 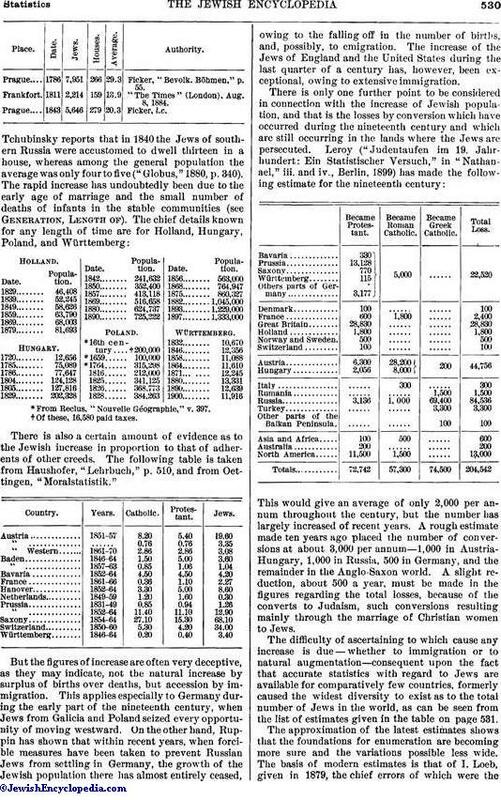 Owing to the large dispersion of the Jews of Russia, Galicia, and Rumania during the past twenty-five years, amounting probably to 1,000,000, a somewhat peculiar statistical condition occurs in the Jewish population of the English-speaking world, where for the most part the emigrants have been received (see Migration). The latter are largely of the most viable ages—between fifteen and forty-five—and therefore the death-rate is very low and the marriage-rate very high. The absence of the aged from the stream of immigration also tends to reduce the death-rate, though it increases the proportion of deaths under the age of five to an abnormal degree. This, for example, is the reason why in London such deaths are more than 50 per cent of the total number of deaths. Number Of Women To 100 Men. Notwithstanding the fact that the number of male births among Jews is larger than among other races, the proportion of Jewesses to Jews is greater than that of females to males in the general population. This is due in large measure to the frequent emigration of young men to seek their fortunes in other lands; hence, in America and England there is a much larger proportion of young men to young women, which again leads to a higher marriage-rate. Bulletin de l'Alliance Israélite Universelle, 1904, pp. 149-170.